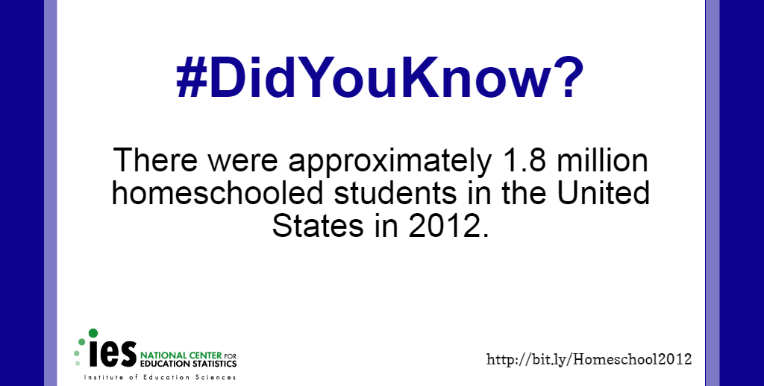 NCES recently released a Statistical Analysis Report called Homeschooling in the United States: 2012. Findings from the report, detailed in a recent blog, show that there is a diverse group of students who are homeschooled. Although NCES makes every attempt to report data on homeschooled students, this diversity can make it difficult to accurately measure all facets of the homeschool population. One of the primary challenges in collecting relevant data on homeschool students is that no complete list of homeschoolers exists, so it can be difficult to locate these individuals. When lists of homeschoolers can be located, problems exist with the level of coverage that they provide. For example, lists of members of local and national homeschooling organizations do not include homeschooling families unaffiliated with the organizations. Customer lists from homeschool curriculum vendors exclude families who access curricula from other sources such as the Internet, public libraries, and general purpose bookstores. For these reasons, collecting data about homeschooling requires a nationally representative household survey, which begins by finding households in which at least one student is homeschooled. Once located, families can vary in their interpretation of what homeschooling is. NCES asks households if anyone in the household is “currently in homeschool instead of attending a public or private school for some or all classes.” About 18 percent of homeschoolers are in a brick-and-mortar school part-time, and families may vary in the extent to which they consider children in school part-time to be homeschoolers. Additionally, with the growth of virtual education and cyber schools, some parents are choosing to have the child schooled at home but not to personally provide instruction. Whether or not parents of students in cyber schools define their child as homeschooled likely varies from family to family. NHES data collection begins with a random sample of addresses distributed across the entire U.S. However, most addresses will not contain any homeschooled students. Because of the low incidence of homeschooling relative to the U.S. population, a large number of households must be screened to find homeschooling students. This leaves us with a small number of completed surveys from homeschooling families relative to studies of students in brick-and-mortar schools. For example, in 2012, the NHES program contacted 159,994 addresses and ended with 397 completed homeschooling surveys. Smaller analytic samples can often result in less precise estimates. Therefore, NCES can estimate only the size of the total homeschool population and some key characteristics of homeschoolers with confidence, but we are not able to accurately report data for very small subgroups. For example, NCES can report the distribution of homeschoolers by race and ethnicity,[iii] but more specific breakouts of the characteristics of homeschooled students within these racial/ethnic groups often cannot be reported due to the small sample sizes and large standard errors. For a more comprehensive explanation of this issue, please see our blog post on standard errors. The reason why this matters is that local-level research on homeschooling families suggests that homeschooling communities across the country may be very diverse. [iv] For example, Black, urban homeschooling families in these studies are often very different from White, rural homeschooling families. Low incidence and high heterogeneity lead to estimates with lower precision. Despite these constraints, the data from NHES continue to be the most comprehensive that we have on homeschoolers. NCES continues to collect data on this important population. The 2016 NHES recently completed collection on homeschooling students, and those data will be released in fall 2017. [i] Henke, R., Kaufman, P. (2000). Issues Related to Estimating the Home-school Population in the United States with National Household Survey Data (NCES 2000-311). National Center for Education Statistics. Institute of Education Sciences. U.S. Department of Education. Washington, DC. [ii] Redford, J., Battle, D., and Bielick, S. (2016). Homeschooling in the United States: 2012 (NCES 2016-096). National Center for Education Statistics, Institute of Education Sciences, U.S. Department of Education. Washington, DC. [iv] Hanna, L.G. (2012). Homeschooling Education: Longitudinal Study of Methods, Materials, and Curricula. Education and Urban Society 44(5): 609–631.